Above: Lisa Perry Striped Crepe Wide-Leg Trousers. 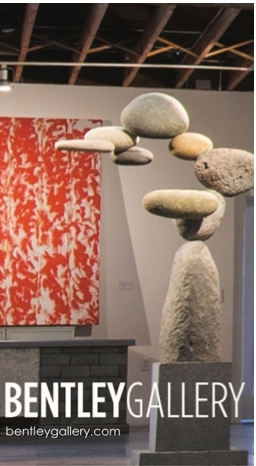 According to fashion experts, athleisure (yes, that’s a new fashion word) takes a decidedly upscale spin this season. 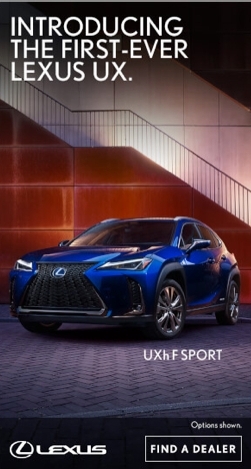 Here’s everything you need to know to pull off the new refined twist on the classic sporty style. Above left: Juan Carlos Obando Women’s Silk Satin Track Pants. Middle: PT01 Women’s Techno Metallic-Striped Slub-Weave Track Pants. 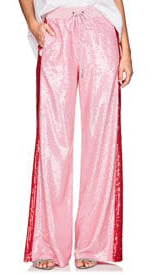 Right: Alberta Ferretti Women’s Sequin-Embellished Track Pants. Laid-back track pants have been a staple of streetwear labels for a while now—Palm Angels does a provocative pink version, and R13 takes it one step further with its shredded, frayed leopard-print style. But, this season, an increasing number of ready-to-wear labels are reaching into the world of urban fashion to create elevated takes on these street essentials. 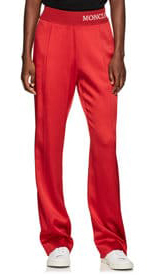 Above left: Prabal Gurung Women’s Wide-Leg Pants. 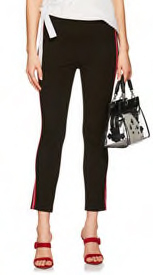 Middle: Moncler Women’s Striped Jersey Track Pants. Right: Maison Margiela Women’s Shiny Tech-Taffeta Pleated Trousers. 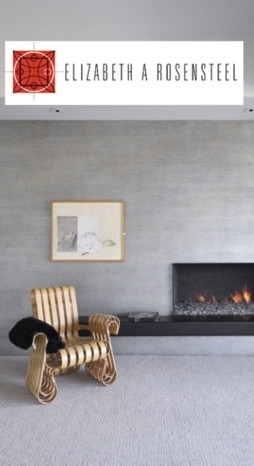 Designers like Lisa Perry, known for her streamlined, feminine aesthetic, are bringing a refined sensibility to this casual look. 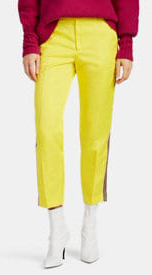 Embellished with rainbow colors, sequins, and rich velvet, these brands are producing a hybrid pant that can be dressed up for work hours or pared down for weekend lounging. 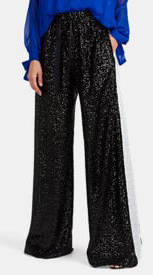 Easy shapes such as Prabal Gurung’s wide-leg pants are elevated to evening status when they are embellished with black sequins. 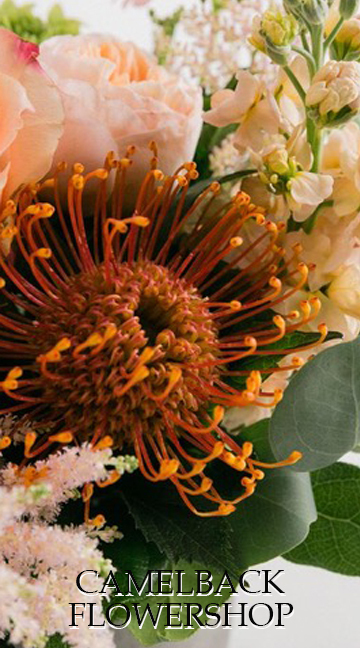 Pair with a feminine chiffon blouse to a complete look. 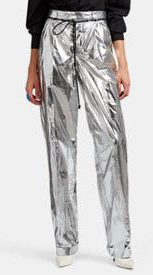 And, masters of subversion, Margiela elevates track pants to astro-extremes with this space-blanket-inspired silver pair, completed with a drawstring waist. 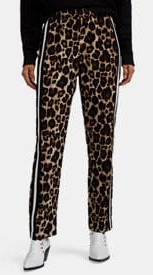 Above left: Robert Rodriguez Women’s Leopard Crepe Track Pants. 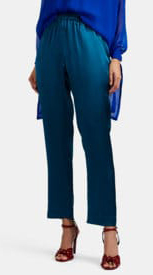 Middle: Officine Générale Women’s Vera Velvet-Striped Wide-Leg Trousers. Right: Rag & Bone Women’s Simone Ponte Cigarette Pants. With bold track pants like Robert Rodriguez’s leopard pants, less is more everywhere else. Add white boots, and top off the look with a beige or black shirt. Keep jewelry simple, like a delicate gold chain and pendant. Or, go white-on-white like Officine Générale. Complete the look with a delicate top, or match your cami to one of the stripes. Finish the look with delicate sandals. To give this look a professional spin, ditch the sneakers and go with kitten heels or feminine flats, like Christian Louboutin’s Eloise or Balenciaga’s Knife Satin Slingback Pumps. Slimmer silhouettes pair well with strappy sandals in eye-catching colors and small, structured bags with graphic patterns and bold hardware. 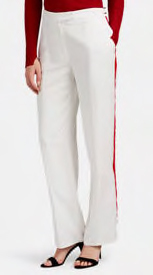 Juxtapose the oversized pants with a feminine, tailored top that plays off the side stripes or adds a contrasting hue. Accessorize with a small structured bag a that adds a pop of color and streamlined jewelry that is delicate without being too formal.